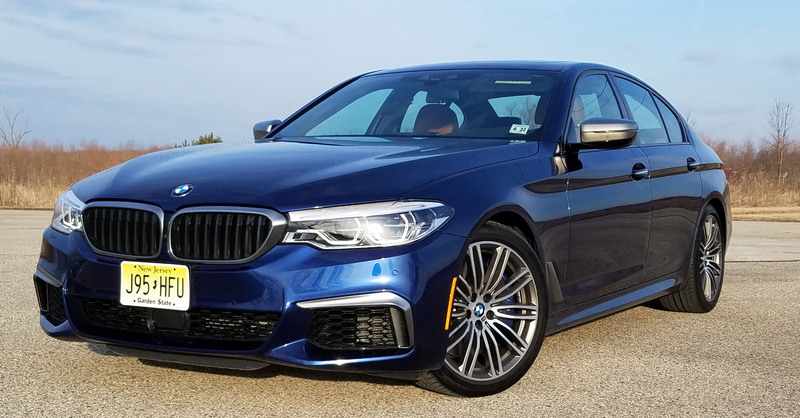 Along comes its sister sport sedan, the M550i xDrive, and well, my lather has returned. That’s because in place of the silky smooth plug-in hybrid system of the 530e, with its 248-horse twin-turbo I4 and electric hybrid system, the 550 drops in a throbbing V8. Yes, this one has a 4.4-liter twin-turbo V8 that creates — hold on — 456 horsepower. 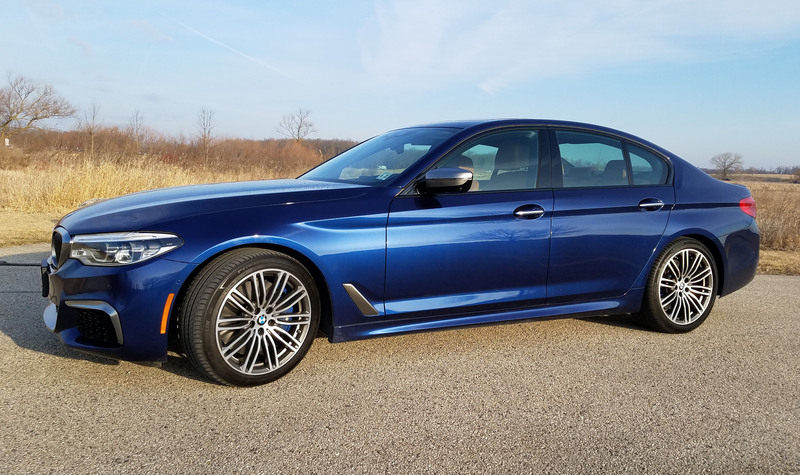 While I, and most other drivers, would be happy with the hybrid’s performance, if you simply must, MUST have a swift kick in the derriere when you drive, well, the 550 is going to rate much higher on your sport sedan gotta-have list. To be fully frank, BMW has something for everyone (performance-wise, if not dollars-wise) in its 5 Series sedans. The base 530i packs a twin-turbo I4 making 248 horsepower and will do 0-60 mph in about 6 seconds; the 540i and its twin-turbo inline six makes 335 horsepower and does 0-60 in less than 5 seconds; and this banshee, the M550i will eclipse 60 mph in less than 4 seconds. I know, I know, we all don’t intend to be racers on the streets, and thank goodness for that. But if performance is your thing, there’s certainly a 5 Series to tickle your timing belt. Price likely will help determine just how much power you need. 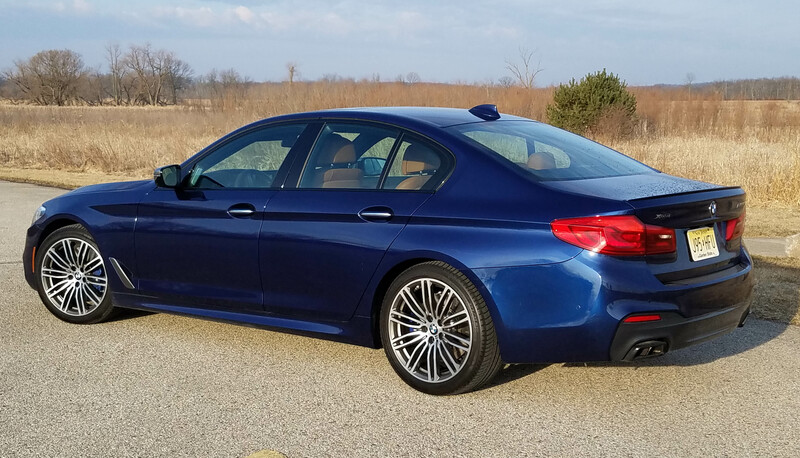 The base 530i with 2.0-liter turbo I4 lists at $53,395 and the hybrid 530e at $55,695, including delivery. 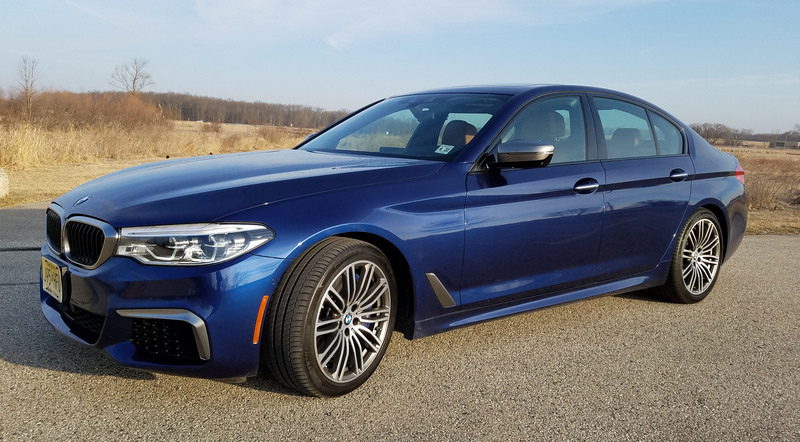 A 540i with 335-horse inline six, starts at $57,000 and the tested upper end 550i with its monsterV8 and xDrive lists at $73,095. 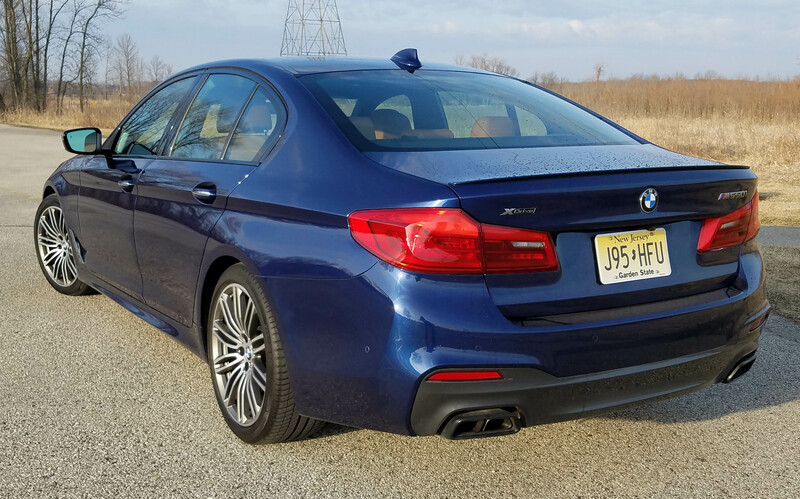 Adding xDrive to lesser models boosts their price by $2,300, and let’s face it, you’ll want xDrive in Wisconsin. But power is the primary benefit of the M550i, and standard features that you’ll pay extra for on the lower trim levels. Standard on the M550i, as with other 5 Series sedans, is a super fine, slick 8-speed Sport automatic transmission. This is perfectly matched to the full-bodied V8. And you can choose between three drive modes, Sport, Comfort and Eco, with Sport holding the lower gears longer for better low-end torque. Comfort is fine for everyday driving and Eco is OK for stop-and-go traffic where you rarely get beyond second gear … think rush hour Chicago traffic. But the drive modes also affect handling. Sport firms the wheel considerably and gives the 550i a high-performance feel. Flick the wheel and the car instantly responds. In Comfort there’s a sporty precision, but not as racy as in Sport. Eco I rarely used. Ride is well controlled at all times and even in Sport mode did not become too stiff. A 117.1-inch wheelbase and 19-inch tires certainly help. Also, bumps are well managed so that you feel you’re always in touch with the pavement, but no matter if pot holes or railroad tracks, you’ll not feel uncomfortable inside the cabin. Note too there’s AWD, known as xDrive at BMW. I had this car during one of our late spring snows and felt I had good traction even in icy conditions. That’s not to say you’d want to drive it as hard in snow and ice as on dry roads, but the footing is still reasonable in slush and snow. Ice? Well, ice is ice! While the exterior is elegant and tastefully styled, it’s not so staid as to be stuffy or look old fashioned. 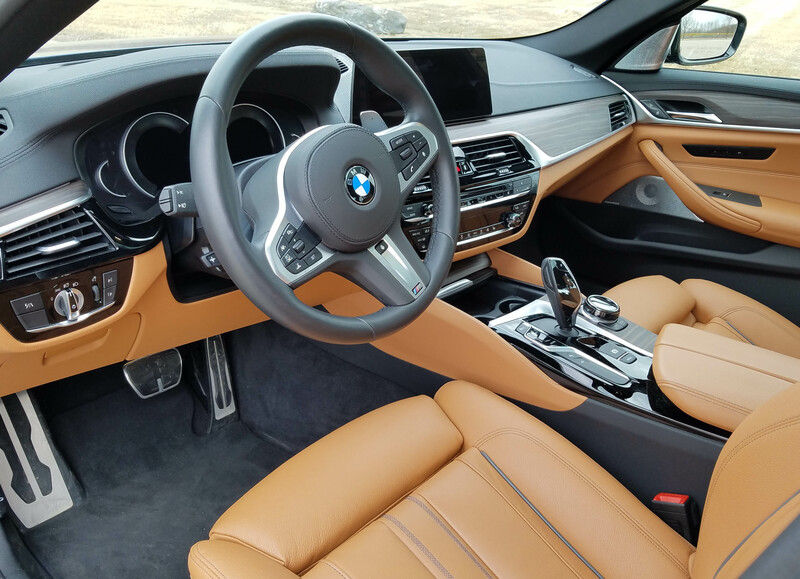 And BMW ups its game on the interior, which, as expected, is hush quiet, although you can still enjoy the burble of the hefty V8 under its hood. Everything looks great inside. The dark Mediterranean blue sedan (no extra charge for the color here) featured a black dash with wood trim facing and with the lower portion in saddle brown leather to match the seats. Saddle has an orange cast to it and looks youthful. 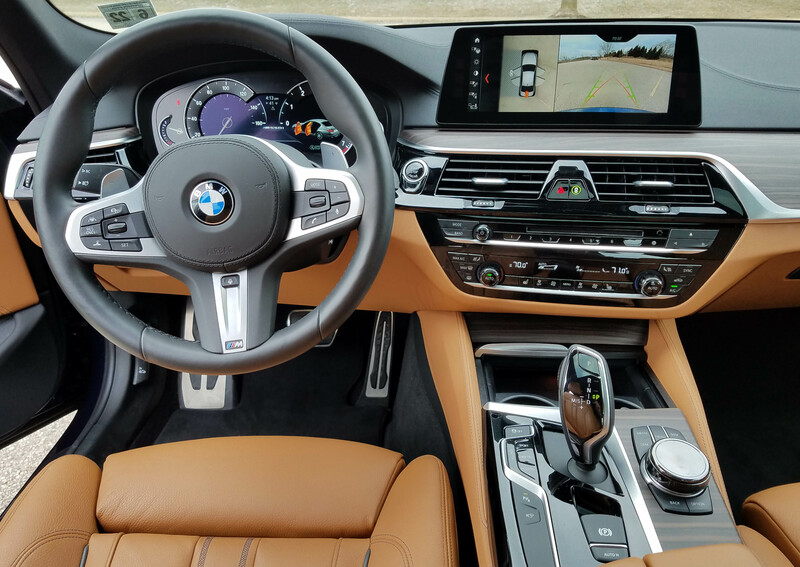 The seats have dark brown stitching and piping too and there’s a gloss black surround on the center stack and console, plus a thick leather steering wheel with matte chrome trim on the hub. The seats though, as in the 530e, are too snug in the hips, which could be tiring on a long trip. There are two memory setting for the driver’s seat and both front seats are 16-way power adjustable, a standard feature. Standard too is a 10.25-inch infotainment touch screen and a CD player. Both are simple to use. But to really spiff up the M550i, six option packages are added. Most important in Wisconsin is the Cold Weather Package for just $800, including heated front and rear seats and a heated steering wheel. The seats up front also are cooled. BMW’s Dynamic Handling Package adds the adaptive M suspension plus active roll stabilization for steadier cornering. It costs $3,600. Two $1,700 packages, Driving Assistance and DA Plus add a head-up display and active driving assistance, including the lane departure system common on many cars now. I’d save the money on both. Another $700 gets you parking assistance and a surround view camera, and for $1,200 you get the Executive Package with automatic soft-close doors, ceramic controls, wireless charging, and enhanced USB and Bluetooth. Seems all that should be standard on a high-end luxury car. Likewise I don’t understand a $300 charge for Apple CarPlay compatibility. And the biggest joke, er, gimmick is Gesture Control, which costs $190. It’s simply not needed. The system allows you to sometimes adjust the radio volume with a hand gesture. It worked so infrequently for me that I was tempted to give the radio a single-finger gesture. More noteworthy is the NightVision system with pedestrian detection. It costs $2,300 and will help sense when a pedestrian looms just out of your vision at night. The beep and braking it will instigate is valuable. A few other standard features include a large sunroof, power tilt/telescope steering wheel, an extremely roomy trunk with power lid, plus a roomy rear seat that will hold three adults. Standard safety equipment includes blind-spot warning, big four-wheel disc brakes, dynamic traction and stability control and the AWD system. There are parking sensors too so you will be less likely to scape your pricey Bimmer’s nose on a curb. What you won’t be able to avoid is the gas station. The M550i drinks premium fuel and is fairly thirsty. I got just 19.0 miles per gallon in a week’s driving, about 40% on the highway. The EPA rates this at just 16 mpg city and 25 mpg highway, the latter of which seems optimistic. But then even our currently rising gas prices may not bother you if you can afford this model. While the test car started at $73 grand and change, with all its luxury add-ons it landed at $88,985. That’s mighty close to $90 grand. 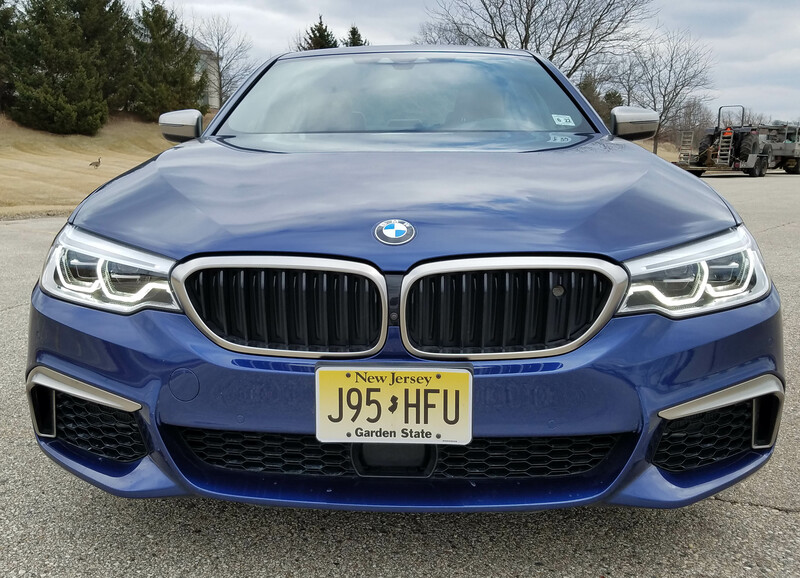 While I enjoyed the M550i’s extra power, the less costly 530e hybrid at $68,670 after adding many of the same option packages as this week’s car, seems the better deal. And I managed 28.4 mpg with the hybrid, even though its charge is good for no more than 16 miles, not quite my drive to work. Either way, performance and luxury are easily handled in any of the BMW 5 Series sedans. But there’s considerable added cost in saying, I gotta have a V8. Hits: Power in spades, good looks, ride, handling, overall smoothness of performance and AWD. Quiet, luxury interior and amenities, heated steering wheel and front/rear seats, cooled front seats, sunroof, power tilt/telescope wheel and trunk, plus roomy interior and trunk. Full boat of safety and tech equipment. Misses: Front seats are a bit too snug, cost is high and V8 drinks premium fuel.